Hola Lexicans! 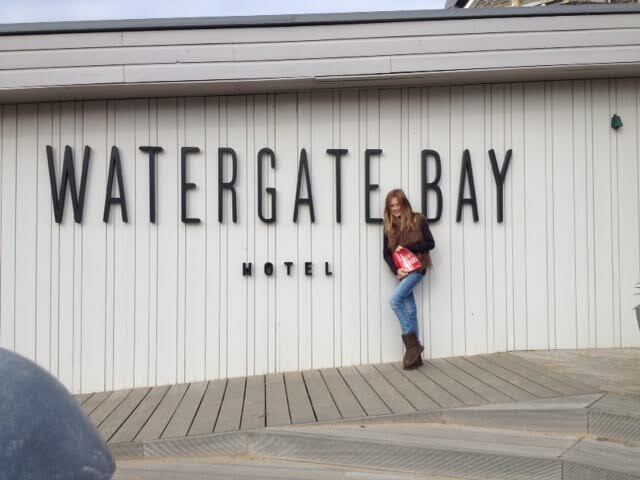 Last weekend, I was staying in Watergate Bay Hotel, Cornwall, and it was amazing! 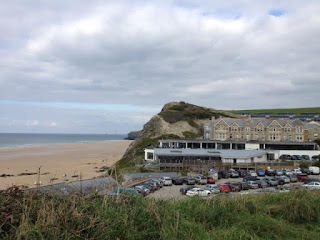 My friend Mollie stayed in WGB last year, and she was raving about it for weeks on end. So when I found out I was going on a review trip there, I was SO excited. We were staying in a family suite, which was really nice because it gave us plenty of space, with a room for my parents, and a separate room with bunk beds and a TV for my siblings and me. Like the reception, it had a really contemporary beach feel and some really comfortable beds too - normally hotel beds aren't as comfy as my one at home, but this actually came very close! This may just be the most important factor when choosing a hotel. We were having our breakfasts in Zacry's, and let's just start with them. THEY HAD A WAFFLE MACHINE! Now being a big waffle-lover, this aroused a lot of excitement (and it's actually on my Christmas list now). The waffles were simply delicious. And filling. As well as that, they also had amazing crispy bacon, a range of cereal, bagels - and a VERY cool bagel slicer to go with it; my sister had a bagel just so she could use that - sausages, egg, a range of pastries (including my favourite, the pain au chocolat), toast and too many more to name in just one blog post. Needless to say, I didn't get the chance to try all of this, much to my disappointment! For lunch, we went to the Beach Hut and I had the best fries EVER (and I've eaten a lot of good fries) as well as a delicious chicken burger. It was so yummy and perfect - I'm so hungry right now!! Dinner was also nice, we had the children's buffet for one night, for younger kids, and the more grown-up one where I had some really tender pork and some chunky chips. And the chocolate mousses which I had for dessert both nights were heavenly. Now, I have NEVER surfed in my life, but it is something I have always wanted to do. So when I found out that as part of this trip I was going on a surf lesson, I was VERY excited! Our instructor was really nice and friendly. We started with some simple bodyboarding (which I haven't done before either!) 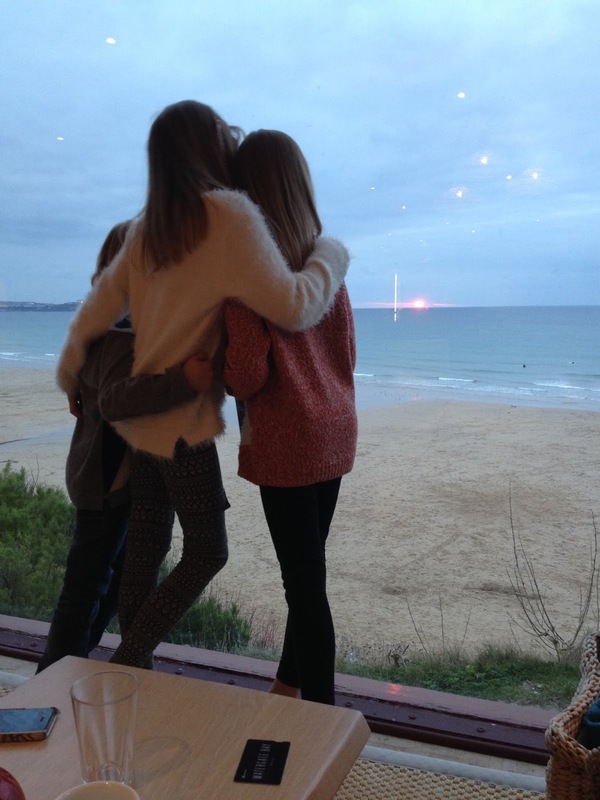 Whilst I was freezing at on the beach, once you got going you going it was so much fun. I fell over so many times - but it wasn't as bad as I'd anticipated, in fact I loved falling in! Finally, a big wave comes, paddle paddle and I'm up, with some cool surfer moves (Okay, so a little exaggerated, but I did it). It was such a thrilling and exhilarating experience, I can't wait to go again *hint hint Mum*! And when my parents did turn up to collect us, I didn't want to leave, and then decided to come back the next morning!!! The pool at WGB is very large and ever so beautiful, with huge windows so we could see the beach whilst we swam, which was stunning. Also, the temperature was just perfect, warm from the moment we got in; I never wanted to it to end! There was also a shallow area for children who aren't very strong swimmers, alongside the main bit, and I had so much fun and while I swimming my mum had what she said was 'the best massage ever'. 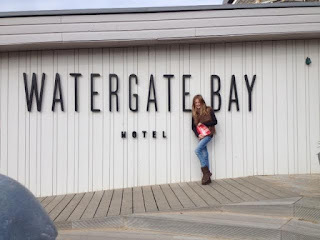 Overall, I had an absolutely AMAZING time in Watergate Bay Hotel, and would love to come again. They had so many fun activities for kids - surfing, swimming, hanging out in the Kids Club and of course eating is pretty much my ideal weekend! And with the beach as its front garden, it was in a perfect destination with stunning views, and I LEARNT HOW TO SURF (I still can't get over that)! 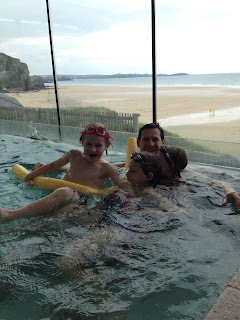 This is such a chilled, family friendly hotel, and I cannot express how much I recommend this for all families. 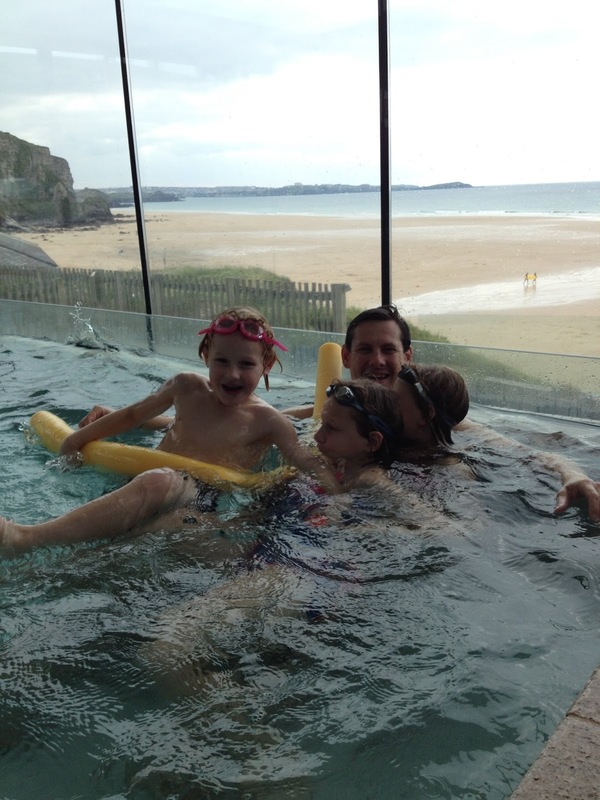 If you are ever planning on visiting Cornwall as a family, then its definitely worth checking out Watergate Bay Hotel - your kids will LOVE it! Wow, Lexie! It sounds great... too bad I'm a long way away from it! Now on my bucket-list! Thanks Maddie! Shame, it was so much fun. It was! Definitely one to plead your parents about, if you ever want to go on holiday! !